From the very beginning of my Ragdoll journey I’d heard the myths like Ragdolls go limp in your arms, and they are more like dogs than cats. Both those myths are borderline true because the Ragdoll is known for its laid back personaltiy and some of them really do go limp in your arms. But not all of them are like this, so that is a myth. The other about them being like dogs also has a ring of truth to it. Many owners have taught their Ragdoll cats how to fetch and most greet their owners at the door. I know mine do. But it’s a myth because Ragdolls are cats. And because they are cats they do have more of an independent spirt than dogs. Yet there were some myths out there that I laughed at because who would believe them? What about the one where Ragdolls are impervious to pain? Or that seal mitted Ragdolls are part Raccoon? There were many Ragdoll myths that I never took seriously because they were too far out there to be believable. I shrugged and laughed at these myths — that is until September 2010. Have you ever heard that Radolls don’t shed? Or that they’re hypoallergenic? I’d heard this from time to time but stuck it in the “Ragdolls are part Raccoon” territory. I mean, who would ever believe there was a cat that didn’t shed, much less a cat that was hypoallergenic? It’s time for me to tell Sukie’s story of such a woman who did believe this myth. I have pictured to the right a darling seal mitted female at 7 wks old out of Daphne x Jeb. That’s Sukie. I had so many people come over to the house and want to take Sukie home with them. And who could blame them what with the way she ran to the door to greet them and sat in their laps purring and making muffins as soon as they sat down. People begged me to take her home, but from the time Sukie was a tiny girl I had decided to keep her for my breeding program. Sukie had one litter with us — a difficult one for various reasons which made me decide to retire her. It’s always been my philosophy that as much as I love my cats and want to keep them with me, that it’s my obligation as a responsible breeder to find retired cats new homes where they can experience what it’s like to be a typical family pet. At the airport I sent an email to Jenny asking that she keep me posted on Sukie’s status, that Sukie meant the world to me and I wanted to make sure she was fitting in well and to let me know if she (Jenny) was having any problems with her. I didn’t hear back. I tried several more times, but I heard nothing. On the Sunday of Labor Day weekend 2010 I received an email from Jenny. I felt so much relief. Finally she decided to contact me. I opened it quickly, then nearly fell out of my chair. The email was filled with accusations that I had lied about Sukie — that Sukie shed but her friend’s Ragdoll kitten didn’t shed. She told me she’d heard on Animal Planet that Ragdolls were also hypoallergenic, but I’d lied about that too because now her kids had allergies. 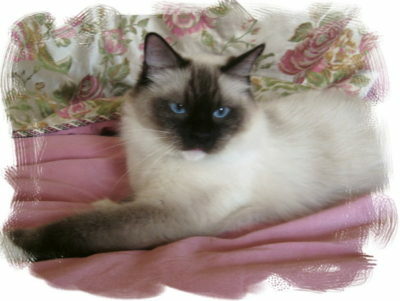 And get this: she said Sukie was very loving and everything a Ragdoll should be, but that she shed. She told me she knew the real reason I found Sukie a new home: because the cat was a problem shedder. The kicker was she gave me two days to send her a goodly amount of money to ransom Sukie from going to Animal Control. She even sent me a Paypal invoice for the amount due! Before I continue, I do want to address this difference Jenny was seeing between Sukie’s coat and that of her friend’s Ragdoll kitten. 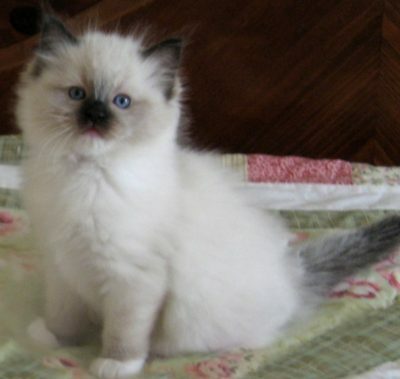 It is true that Ragdoll kittens shed less and people who are typically allergic to other cats are able to be around Ragdolls when they are under a year. This is where the myth originated. The myth looses its steam when Ragdolls reach that first Spring and Fall shed after their first year. In Sukie’s case it was the Fall shed that set this woman off. First I explained as best I could to Jenny that she’d been taken in by a relatively common myth. But she told me she’d heard all this on Animal Planet so it must be true. There wasn’t anyway for me to ransom Sukie. I tried calling the Orlando Police Department and the Animal Control. Because Sukie had lived with this woman for over 30 days (in fact she’d been under Jenny’s care for over 3 months) I had no say in what happend to the cat. Even if I flew to Florida right then and there I wouldn’t have been able to claim Sukie as my own property. Once a RegencyRags kitten, always a RegencyRags kitten. I would have taken Sukie back if she’d let me have her without the ransom. I even offered to find her a new home then send her the money from the sale. That wasn’t good enough for Jenny. She wanted me to pay for what I’d put her through with my deceitful practices. I ask that people not get so involved in the Ragdoll hype that they forget these are cats. Yes, Ragdolls do make wonderful pets, but they are animals just the same. Animals shed, it’s just a plain fact. You have to clean up after animals. They make messes. They run around the house and disturb you when you’re asleep. That’s just what cats do. Just because you bring a Ragdoll into your home doesn’t mean you’ve invited a magical creature to live with you. I never want someone to think I’ve misled them into believing that Ragdoll cats are more than they are. At the end of the hype, Ragdolls are still cats. 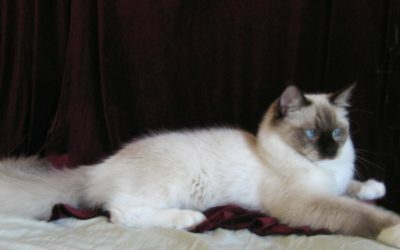 Out of all the beautiful Ragdolls I’ve entrusted with new owners, Sukie is my one regret and the reason I now only place Retired Breeders within Texas.